If you missed out on our Halloween themed Twitter party Wednesday, you missed out on some fun! We got together with some of our favorite crafty people and some new friends and talked Halloween decorations, Halloween costumes, and Halloween recipes! Since we didn’t want anyone who couldn’t make it to feel left out, we pulled some of the highlights from the questions we asked for you to scroll through. Q1: Welcome! Let’s do intros. Tell us a little bit about YOU. 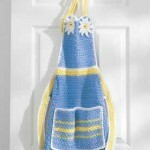 @CraftyChica: Q1: i’m Kathy and I like to make stuff. Lots of stuff. All the time. @CynGagen: Q1 I’m Cyn from Creative Cynchronicity. I love to craft and I love Halloween! 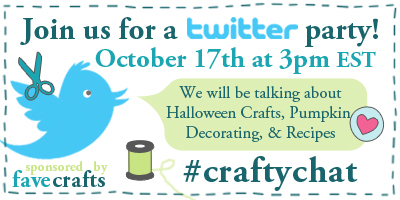 @LionBrandYarn: Hey, crafty chatters! This is Jess from Lion Brand Yarn. 🙂 I love to knit and crochet. @MarkMontano: I’m a Gemini and cat hoarder and I love long walks in the 99c store. That’s me in a nutshell. Great response from @CraftyChica! Im a Sag, a Chihuahua hoarder and I love long strolls in the Mexican grocery store ceramic and candy aisles! Q2: Halloween- You like it scary or cute? @shala_beads: I like it both ways, scary and cute. Preferably glittered as well! @MyPaperMoose: Q2: How about a little somewhere in between? But more cute than scary I suppose! @cristinfrank: I like cute Halloween decorations but tend to do more Tim Burton-ish crafts. I want to do a candy corn craft – open to ideas! @MarkMontano: I do love ripping off a baby doll head and dipping it in plaster. Kind of creepy, but satisfying at the same time. @LionBrandYarn: Q2. Both! You know, a knitting needle saves the day (briefly) in John Carpenters Halloween! Q3: What’s one thing you always make for Halloween? @shala_beads: Q3- My family always makes pumpkin butter with our jack-o-lanterns. Yum yum. Q4: Do you have a favorite Halloween recipe? @cristinfrank: I always make pumpkin soup on Halloween. There was a recipe in Parade (sunday insert) that I’m going to try. @spazzgirl: Q4: There’s lots of yummy recipes with leftover candies too but I rarely have a leftover! Q5: Costumes: do you make them or buy them? @shala_beads: Q5- MAKE! It’s the only way to go. @SewCalGal: Q5: I prefer to make costumes vs buy them. @LionBrandYarn: I almost always make my own costume. I have more freedom that way! @CraftyChica: We always make our own costumes, or do a halfway handmade and alter a store-bought version. Q6: Last one! Haunted Houses, love them or hate them? @craftyvanessa: I have a love/hate relationship with haunted houses! I always say I’m never going back, but I always do. @CraftyChica: I love the concept of them, but Im too chicken to survive one! @SewCalGal: Q10 – I love haunted houses even though many still scare me. Still get a kick at Disney’s Haunted House. Sad you missed out on the fun? You can still read most of the tweets in Twitter, but next time be sure to join! Don’t forget you still have 2 days to enter your fabulous pumpkin decorating ideas in our Pumpkinpalooza contest! Do you have a pattern for a tote bag that would fit on a Hoverround Scooter?? Thanks. I didn’t have a chance to participate in the Twiiter party. I look forward to reading additional information and advice in the future.